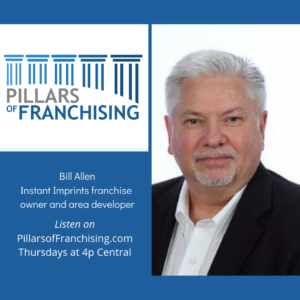 Bill Allen is the owner of the Instant Imprints franchisee in St Louis for the past 12 years. Instant Imprints of St Louis provides many types of “custom printing and decoration” such as Embroidery, Screen Printing, Ad Specialties, Heat Transfers, Signs, Banners, window graphics, vehicle graphics and document printing. Instant Imprints is mainly a B2B Business but they have retail storefronts resulting in about 20% of their sales coming from B2C clients. They specialize in small to medium size businesses, sports teams, schools, churches, fleet accounts and municipalities. Bill is the Instant Imprints franchise Area Developer for Missouri and Illinois which makes him responsible for growing the brand by assisting those who are interested in buying an Instant Imprints franchise. Currently there are 5 franchises in the St. Louis market.